Chaos Orb may be banned in sanctioned formats – as well as “casual” formats like Australian Highlander that take themselves way too seriously – but it is surprisingly influential, considering that. Way back in the 90s, there was a meme or possibly urban legend that inspired Chaos Confetti from Unglued, and the legacy of dexterity cards lives on in the likes of Unstable‘s Slaying Mantis (Six One Nine!). Now that Old School 93/94 is a format, it even has a chance to be a constructed staple again, and that is surely no surprise when it is so cheap, destroys any permanent you are steady enough to aim at, and comes back forever when Argivian Archaeologist is on the table. Let’s start with the obvious: Chaos Orb is one of the few cards to be mega-banned. Alongside the suite of ante cards, the other dexterity cards (Falling Star), and Shahrazad, Chaos Orb is literally unable to be played in any format by its rules, including Vintage. Not that you’d want to be flinging this around, since Chaos Orb has a sticker price higher than my brother’s receding hairline. 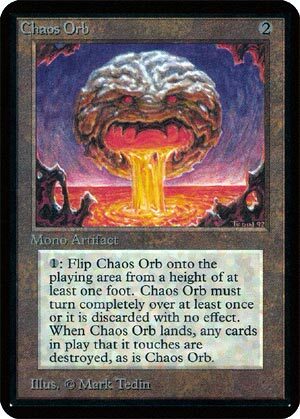 All the same, Chaos Orb is an interesting curio: for three mana, you can blow anything up. If your aim is good! It’s one of the iconic cards in lore, having shown up in popular culture, inspiring Unglued‘s Chaos Confetti, and making its way into The Binding of Isaac. Is it particularly good? No; it’s unreliable, able to be gamed, and can backfire. But is it awesome? Absolutely.